Instagram is one of the most loved Social Networking platform that allow users to share their memories and moments of fun with their friends and family. While there are many things that people can do using it such as posting pictures, messaging friends etc. One thing that is most loved amongst users is Instagram Stories. Instagram Stories are a series of pictures or videos that can be of almost 15 seconds in length and stay for 24 hours. While this is the current trending way to share memories, Instagram, however, does not have an inbuilt feature to add any music to these Stories.There are video editing apps available on App Store and Play Store that you can use to add music to your Instagram Stories and make them more interesting and today we will explore one of them – Storybeat. Storybeat is a great app that gives you the ability to add music and sound effects to your videos or photographs. With the Storybeat app you can spice up your Instagram posts with cool music and sound effects within seconds. 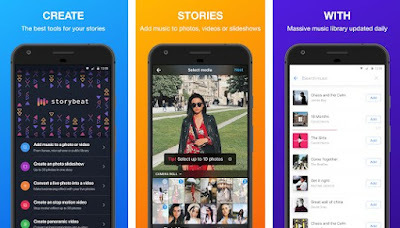 If you found adding music to your Instagram Stories and photos to be hard or complicated, Storybeat can help you with is simple and easy to use options. The process of adding the song or sound effect over your story, photo or video is extremly simple with options to choose your favorite part of the song and more. The app privdes millions of tracks you can choose from, no matter the genre, Storybeat probably can add it to your photograph or video. You can use the Storybeat app to add music to any photo or video from your phone’s library, you can add sound effects to your photos and videos, you can record your voice on any other sounds, you can add your favorite songs to your photos or videos, you can even create photo slideshows with your favorite music and create a stop motion video with music. The developers revealed that new features will be coming soon; couple of them are adding panoramic effects to your photographs with music and adding a zoom effect to your photos with music. All said, this app is an amazing asset for every savy social media user. Engaging and interesting photographs and videos can make or break your social media game, and the Storybeat app can help with that. You can find and download the Storybeat app for free at the Google Play Store and the App Store.